Discovering Music Activity Table is rated 2.0 out of 5 by 34. 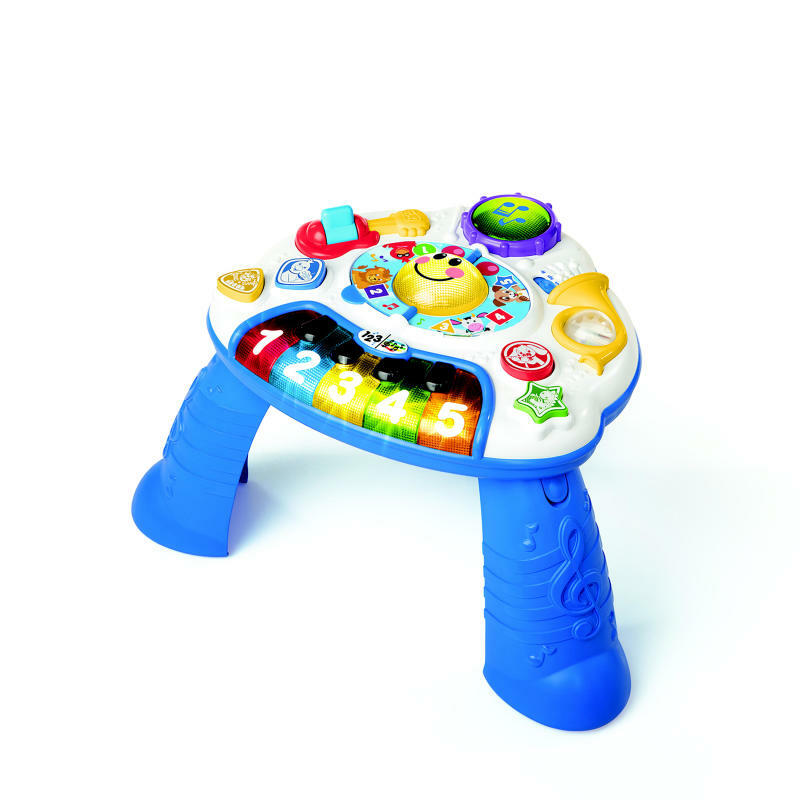 Babies are naturally drawn to music, and the Baby Einstein Discovering Music Activity Table will have your little one coming back for encore after encore. Introduce your child to a world of creativity with an activity center that helps them discover and make music. Babies can tap the piano keys to hear musical notes, and with the switch of a button the piano keys will introduce colors and numbers. The strummable guitar, tappable drum, and spinnable French horn ensure your little composer will have a blast exploring baby instruments. At the center of the table, a music book is ready for your baby to flip the page and activate melodies, lights and discovery modes. The music development table grows with your baby – it’s great for floor play without the legs for younger babies or attach the legs for stand and play discovery. Dimension (in) 16.5" x 4.5" x 15"
Rated 1 out of 5 by bolorinosj from Worked great.....for 9 months!! Was offered to our baby about 9 month ago and stopped working a month ago. And I had the legs problem too, like everybody else I guess!! Rated 1 out of 5 by jlh2012 from The Legs DONT Come Off! My daughter got this toy for Christmas from her aunt and uncle. She is 6 months old and can't stand up on her own so being able to lay the toy across her lap was so nice or let her push the buttons with her feet. However, my husband attached the legs without reading the instructions while I was at work and after trying to remove them I discovered that they CANNOT be removed. I was furious when I realized this. My mom has one that has legs that can be detached and moved around which is so much more convenient and it's older! So now my daughter can't enjoy this toy until she is old enough to stand up. Seems like a waste to me. What happens when we have another baby? That one just doesn't get to have it on his or her lap at all?! That is just WRONG! So I will probably never buy any Baby Einstein products from now on. Rated 2 out of 5 by DanielleC from Such a Shame I bought this for my infant daughter and much like other parents, I am beyond frustrated that the legs do not come off once installed. It slides on hardwood, cannot be weighed down on the legs and constantly slides. When gripping this to pull herself up, it either slides forward causing her to fall forward, or she falls back and takes it with her, causing it to fall on top of her. I am very disappointed. She loves playing with but more often than not, it causes her to fall and cry.